Munich - It was a day at the office with a twist for the FC Bayern München stars on Tuesday, as they took part in the annual photo shoot with one of the club's sponsors - Paulaner - following the morning training session. After working up a sweat in preparation for Saturday's home fixture against Bayer 04 Leverkusen, Pep Guardiola's charges swapped their tracksuits for the local attire traditionally worn during Munich's Oktoberfest, which is set to begin on 19 September. 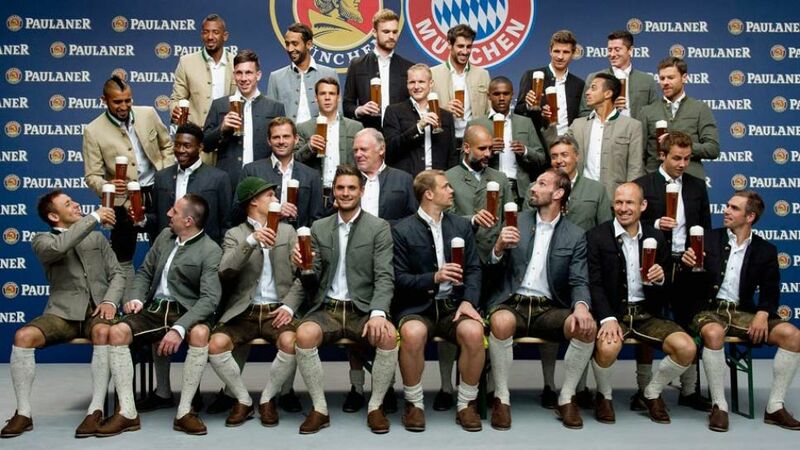 Munich-based brewery Paulaner has sponsored Bayern for many years and in anticipation of the upcoming festivities, they organised the photo shoot at the club's Säbener Strasse headquarters, setting up benches so that the shots could be composed against a backdrop of a typical Biergarden. David Alaba and Co. may be all smiles in the picture below, but once the Oktoberfest starts in earnest they may not be so cheerful. Bayern face last season's Bundesliga runners-up VfL Wolfsburg on Matchday 6 (22 September) and then host Borussia Dortmund in der Klassiker two weeks later on Matchday 8. And that's not all, as over the years Bayern have had a worse record during the three weeks of the beer festival than they do when it is not taking place. But there's still a long way to go until then, and the Bayern camp were in good spirits as they struck a variety of poses!